The Prelims is 4 vs 4 but as the crews advances you have to eliminate one teammate from your crew. So then, the top 8 round becomes a 3 vs 3 and as your crew advances, top 4 will be 2 vs 2. Final battle is of course 1 vs 1, the Soul Survivor. 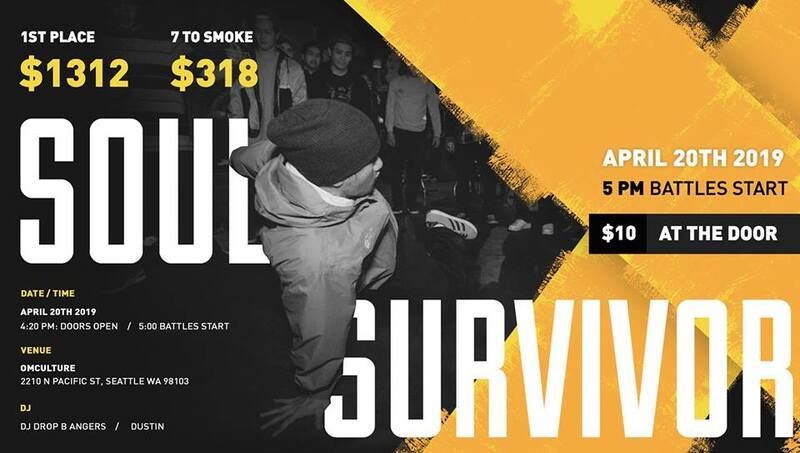 We are also excited to add a new addition to the Soul Survivor battle format this year, as the crews advance to the top 8, top 4, and the final battle, the number of rounds increases. Prelims is 1 round each dancer, top 8 is 2 rounds each dancer, and top 4 will be 3 rounds each dancer, and the final, 4 rounds each dancer. Can you survive the final battle!? Teammates can be brought back as crews advances. For example, the member who was chosen to sit out during the 3vs3 can be brought back to compete into the 2vs2 or the final battle. Any questions or concerns please comment below. 206 Universal is a non-profit organization dedicated to providing accessible spaces while serving communities through the upliftment, preservation, and celebration of Hip Hop culture. © 206 Zulu. All Rights Reserved.